Bralca Coldstore of Newbridge, County Kildare has earned a deserved reputation as ‘the Cold Store with the personal touch’. Managing Director Sylvia Meade places a major emphasis on making sure their customers’ needs are met at all times and takes great pride in the company’s impressive strike rate. Are you looking for a cold storage facility for your perishable goods which is ideally located in the centre of the country? If you supply Frozen, Chilled, Ambient, pharmaceuticals and other products then your first requirement will be warehousing those goods to maintain the temperature the goods require to be stored at. That’s where Bralca Coldstore Ltd can help. Established in 1999, they provide Storage and Distribution for the Frozen, Chilled and Ambient Food sectors and specialise in full pallet, case picking, full loads and groupage. Bralca Coldstore is a family run business which enables them to provide a complete package and makes them highly competitive, while paying particular attention to service. 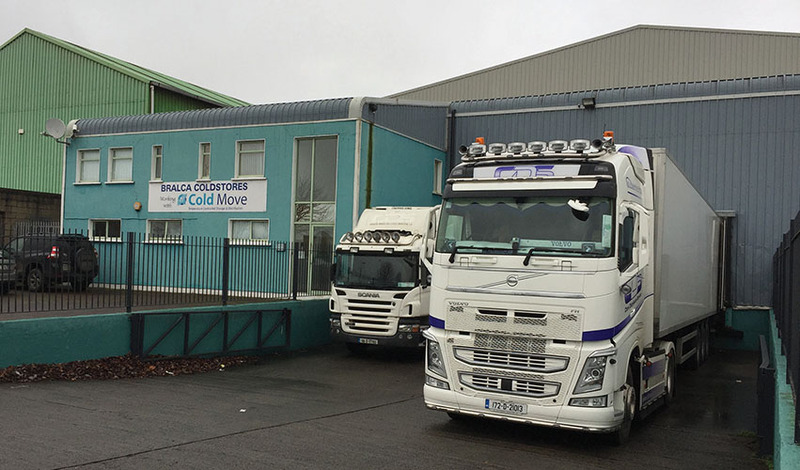 Fully approved by the Department of Agriculture, Food and the Marine and BRC AA rating accredited, Bralca Coldstore’s strategic location just off the M7, M9 and M50 road networks, enables them to service their customers nationwide. “We’re situated just off the M7 and M9 motorways here in Newbridge and that gives us a great advantage,” Naas native Sylvia Meade – who boasts a lengthy involvement in the transport sector - enthused. Valued clients such as Cold Move (Galway) and Newbridge Foods can vouch for the professionalism that Sylvia and her team of six employees bring to the table. “Our partnership with Cold Move stretches back to 2008 and we act as their Kildare hub. They have a lot of customers under their heading, such as Lily O’Briens, Freiberger UK and Aryzta Food Solutions. We also work closely with Newbridge Foods, which is owned by Dunnes Stores, and export to the UK. Bralca Coldstore work with customers across Ireland and the UK, to deliver storage and distribution solutions and no job is too big or too small from their perspective. “We value the small customer as much as the big guys,” Sylvia added. “Our customers range from one pallet to 1,000 pallets jobs. Down through the years we have seen our customer base grow and grow and we also derive great pleasure from helping our customers to grow their respective businesses. That approach helped us survive through a very crippling recession. Sylvia was keen to shine a light on the role her staff, which includes her daughter Ellie, plays in the smooth running of the business. With the uncertainty surrounding Brexit in mind, there are no expansion plans in the pipeline at the moment. Retaining customers has never been a problem for Bralca Coldstore in the past. Above all they try to ensure that every customer they deal with is 100% satisfied and if there is any problem, large or small, they have always tried to resolve it to the best of their ability to the customer’s satisfaction.